I was going through some papers recently and discovered a copy of a letter I had written to His Eminence Antonio Cañizares Llovera on January 3, 2011 -- so, almost exactly six years ago. It brought back to mind in a powerful way the difference between our situation then and our situation now. 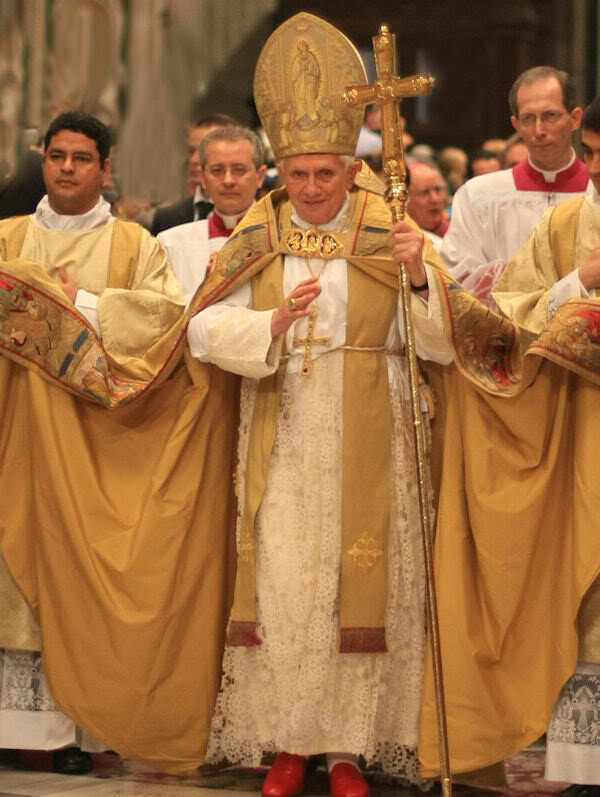 In 2011, one could really believe (with a tinge of youthful optimism) that the combination of a pope of restorative liturgical vision and a sympathetic prefect of the CDWDS could give traction to a long-overdue "Reform of the Reform." It seemed as if we were just around the corner from correcting a host of abuses and missteps. Perhaps in that period lovers of the sacred liturgy were just too sanguine about the magnitude and solubility of the crisis and too reliant on top-down action. It has been good for us to be weaned of illusions and false expectations, even as we are being weaned, more and more, from whatever residual hyperultramontanism we might have imbibed from our neoconservative catechesis. At the same time, as so many recent photoposts have shown, the ROTR at the grassroots level continues to gain ground, if painfully slowly, as the usus antiquior and a more "Oratorian" ars celebrandi win over more and more of the young clergy and the people who are still interested in going to church. I would like to share this letter because it may be of help to those who are involved in the real conversations that are still taking place at the local level -- conversations we must continue to strive to influence as much as we can. Pax Domini. As a Thomist theologian, a long-time student of the sacred liturgy, a choir director, and a Catholic who goes to Mass daily, I have pondered certain issues for years that I now wish to put before you in a formal way, knowing that I am not alone in my hopes that your Congregation will be able to find effective ways to address these issues in the years to come. Although nothing I mention will be unfamiliar to you, perhaps the combination of growing discontent among the faithful and the favorable time of Pope Benedict’s pontificate suggest that the kairos for action has at last arrived—as well as the need for stronger measures to ensure adherence to common norms. Those who are well-informed about the sacred liturgy know that the practice of celebrating Mass ad orientem is an unbroken tradition of all churches, Eastern and Western, until the custom was abruptly changed in the 1960s and 1970s. It has also been demonstrated that the adoption of the versus populum stance was never mandated, and that, as a matter of fact, the rubrics of the Missal of the Ordinary Form presuppose that the priest is celebrating ad orientem. Our Holy Father has written about this issue, and, of course, he makes an explicit reference to the definitive study, Turning Towards the Lord, by your Congregation’s own Fr. U. Michael Lang. All of this is no longer a matter of any doubt. What remains doubtful is how we can recover this apostolic, praiseworthy, and reasonable tradition. It seems that the Congregation owes to the Catholic world a clarification that both explains the meaning and history of the ad orientem stance and clearly underlines that any priest may, at any time, celebrate Mass ad orientem. It seems that many priests are uncertain about whether they are allowed to do so; certainly many bishops do not seem to understand that this is practice is compatible with, and even preferred for, the Roman Rite in either of its forms. In spite of those solemn words, the venerable Roman Canon has nearly disappeared from the life of the Church today. There are many parishes where it is rarely or never heard, and as a result, many Catholics are unacquainted with its riches. Many priests automatically use Eucharistic Prayer II because it is the shortest, or, if they are not so concerned about speed, Eucharistic Prayer III because they like it best. The virtual abandonment of the Roman Canon, contrary to the judgment of the Fathers of the Council of Trent, is a novelty without parallel in the entire history of the Latin-rite liturgy; it is a manifest example of the hermeneutic of rupture and discontinuity. As a solution, could not the use of the Roman Canon be mandated for certain days, e.g., solemnities of Our Lord and Our Lady, or even the principal Mass of every Sunday? And could not Eucharistic Prayer II be limited to ferial days when there is no commemoration of a saint? The Lord gave me, and gives me still, such faith in priests who live according to the rite of the holy Roman Church because of their orders that, were they to persecute me, I would still want to have recourse to them…..And I act in this way because, in this world, I see nothing physically of the most high Son of God except His most holy Body and Blood which they receive and they alone administer to others. I want to have these most holy mysteries honoured and venerated above all things and I want to reserve them in precious places. According to a long series of unequivocal magisterial documents—including Fidei custos (1969), Immensae caritatis (1973), Holy Communion and the Worship of the Eucharist (also 1973), Domenicae Coenae (1980), Inaestimabile Donum (1980), On Certain Questions Regarding the Collaboration of the Non-Ordained Faithful (1997), and Redemptionis Sacramentum (2005)—extraordinary ministers of holy communion are to be used for one of three reasons only: when there is no ordinary minister; when the ordinary ministers are impeded by ill health, advanced age, or demands of another pastoral ministry; when the number of the faithful requesting holy communion is so large that the celebration of Mass would be unduly prolonged. These are the only reasons ever mentioned in official documents. Extraordinary ministers may distribute Holy Communion at eucharistic celebrations only when there are no ordained ministers present or when those ordained ministers present at a liturgical celebration are truly unable to distribute Holy Communion. They may also exercise this function at eucharistic celebrations where there are particularly large numbers of the faithful and which would be excessively prolonged because of an insufficient number of ordained ministers to distribute Holy Communion. The Church’s documents are clear. In spite of such clarity, however, the practice of habitually employing extraordinary ministers of holy communion has become a fixed rule, almost a requirement, certainly in the United States, but also elsewhere. The prescribed rule is consistently violated around the world. Why? Because apparently many believe that communion must or should be offered under both species as a rule. It therefore seems to be the right time to establish a policy about the non-necessity and even non-advisability of communion under both species except for special circumstances (as envisioned by Sacrosanctum Concilium, n. 55), as well as the impropriety and illegitimacy of employing extraordinary ministers on an ordinary basis, and to require bishops to enforce this throughout their dioceses. It should also be required that wherever there is more than one ordinary minister residing at a parish or chapel, all of them, and only they, should distribute holy communion (cf. SC, n. 28), as was once the universal custom. The aforementioned magisterial documents speak of limited circumstances when extraordinary ministers might be employed. Today in many dioceses, there is no longer any limitation on the use of EMHCs, to the point where typical Catholics could be forgiven for thinking that there is no connection at all between holy orders and the distribution of the Holy Eucharist—in other words, that anyone has the right and business to handle the most holy things. The results are plain to see: presumption, casualness, desacralization, laicization, democratization, loss of belief in the Real Presence, and loss of awareness of the essential distinction between the ministerial priesthood and the universal priesthood of the baptized, which St. Thomas sees as consisting, respectively, in the bestowal and the reception of divine things. The minister bestows in the person of Christ, while the Christian, as such (including the minister qua baptized) receives gifts from Him. This vital and fundamental truth about the order of redemption is being broken down and watered down continually with the passing of each year. The longer this abuse lasts, the greater will be the spiritual damage to Catholics, and the more difficult it will be to ensure orthodox Eucharistic faith. Bishop Athanasius Schneider’s book Dominus Est! 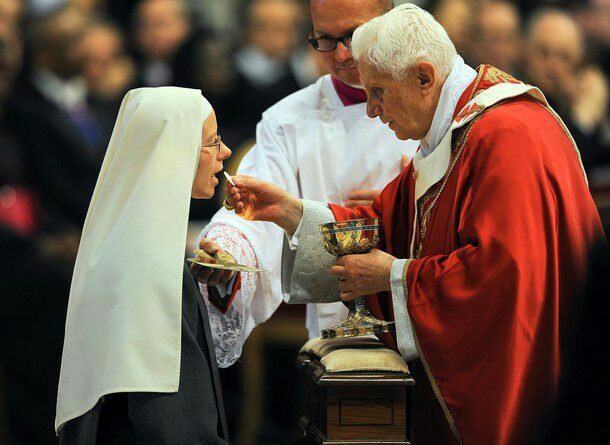 pleads for the reconsideration and reacceptance of the once-universal custom of receiving the Blessed Sacrament on the tongue and on one’s knees, as we see the Holy Father doing at his Masses. I realize that the Pope wishes to lead rather by example than by legislation, but it remains a scandal that the vast majority of Catholics do not know that communion on the tongue is the ordinary manner of receiving, one that should be preferred for theological reasons and pastoral reasons—not least of which are the increasing dangers of profanation by Satanists, militant social activists, and ignorant visitors. It is scandalous that the faithful do not know that kneeling is the traditional posture of the Latin Church and one that is always and everywhere permitted to the faithful. It is a scandal that communion rails continue to be torn out of old churches undergoing renovation, when they should be retained and utilized. In general, one must ask: Is there nothing that can be done “from the top down” to help revitalize the important customs that ought to surround the Holy Eucharist, as part of our cultus of latria for this Most Holy Sacrament? While it is true that in theory any lay person may substitute for the role of an instituted acolyte, there are huge reasons of convenientia or fittingness as to why this substitutional ministry should be exercised by men only and not by women. It is unfitting for women to minister in the sanctuary, the sacred space par excellence where our Lord’s ministers, who represent Him as living “icons,” perform their service. It is unfitting for women to serve in a ministry that so closely points to and pertains to the ministerial priesthood—so much so that it was once seen as an effective way to awaken in the souls of boys and young men vocations to the priesthood, through intimacy with the Church’s liturgical life. It is unfitting, and very sad, to see how boys are now much less willing to serve when there are so many girls of the same age, with whom they do not wish to associate for well-understood psychological reasons. In short, this practice has increased the ongoing “feminization” of the Church, which was exactly what its feminist proponents intended it to do. It has caused immense damage that will eventually need to be repaired if the Church’s worship is to become healthy again. It is admittedly a difficult problem, but denying that it is a problem or ignoring the urgent need for a solution will only allow the situation to worsen. So many people today are writing about the serious crisis in sacred music that there is no need to say much. We all know that the teaching of the Second Vatican Council on the primacy of Gregorian chant as well as the retention of the Latin language in the Church’s liturgy has been ignored and even treated with contempt. Indeed, one of the most obvious examples of rupture and discontinuity in Catholic life is the loss of both Latin and plainchant. Accordingly, any genuine renewal of the liturgy, any organic process of improving the Ordinary Form, demands a rediscovery of the Church’s own mother tongue and her own special form of sacred song (which could include vernacular plainchant as well). It would seem that, as time goes on, these treasures, though by no means completely buried, are in danger of being marginalized as the peculiar tastes of a cultural elite. Firm and decisive action would be required to re-introduce and normalize their presence in the life of each and every parish on the face of the earth, precisely to guarantee that “the substantial unity of the Roman Rite is preserved” (SC, n. 38). Could not the use of Latin for certain parts of the Mass, as envisioned by Sacrosanctum Concilium, be mandated for particular solemnities or occasions? Could not the training of seminarians be required to include not only a general introduction to Latin (still absent in some places, in violation of Canon Law) but a specific practicum for celebrating the Ordinary Form in Latin, in addition to training in the celebration of the Extraordinary Form? There are now, and I say it with gratitude, quite a number of good bishops who would be open to such programs, but perhaps they are waiting for someone in a higher position of authority to give them a signal. Your Eminence, I thank you for taking time to consider this heartfelt plea of a son of the Church, who, in return, will offer up prayers for you. I wish you a blessed New Year of Our Lord.